Twice a month two Japanese men put on scuba gear and go diving. One is looking for his wife, the other for his daughter, both of whom were swept away by the devastating tsunami that struck Japan four years ago. They know they are no longer alive, but the hope of finding something - anything - gives them a much-needed sense of purpose. Underneath the glittering waters of Onagawa Bay, in Japan's north-eastern Miyagi Prefecture, fridges, TVs, cars, trucks and fishing gear lie scattered on the sea floor, under a layer of mud. "Imagine a big city, put it in a grinder and throw it all into the ocean," is how one oceanographer described the effect of the Japanese tsunami. Under water, things are still mostly where they were left by the violence of the waves. In the sunlight up above, on the other hand, everything has changed. Fishing boats are again going about their business - the Japanese diet is built around seafood and it's a key part of the local economy. The wreckage of a thriving port has been cleaned away. In its place there is now a vast expanse of concrete - empty except for, in one corner, a modest shrine made up of some laminated pages of A4, a pink plastic chrysanthemum, and, rather incongruously, a Christmas tree. This is where the Onagawa branch of the Shichijushichi (77) Bank used to stand and the shrine is there to commemorate it. When the tsunami warning sounded at 14:50 on the afternoon of 11 March 2011, the bank's employees were busy tidying up the damage caused by the earthquake that had shaken the building a few minutes earlier. Their manager was out seeing clients. Driving back along the coast he could see the sea sharply withdrawing - a sure sign of an imminent tsunami. As soon as he walked in he told everyone to stop and to climb on to the roof of the two-storey building as quickly as possible. Sure enough, as soon as they got there, they heard the siren and the municipal broadcast warning people to evacuate to high ground - just a few hundred metres away were the steep slopes of Mount Horikiri, where some people were already seeking shelter. One employee asked if she could go home because she was worried about her children. The manager said he couldn't stop her, so she ran to her car, which was parked 300m away, and drove home. The manager told those remaining to watch the sea, just 100m away in normal conditions, and to listen out for further news. The radio warned that a 6m-high tsunami would hit at 15:10. Among the 13 bank employees up on the roof that day was 47-year-old Yuko Takamatsu. Her husband Yasuo had dropped her off by car that morning, though they only lived a few minutes' drive away. During the short journey they had talked about what to have for dinner. "Don't say: 'Anything is fine!'" she had said. With Yuko on the roof was her colleague, 26-year-old Emi Narita, from the neighbouring town of Ishinomaki, where her father Masaaki ran a fish-processing plant. She had seen him just the night before, when she went over to pick up her dinner - her grandmother still liked to cook for her. As the workers stood nervously on the roof they debated whether there was time to flee to the nearby hospital - a much taller and stronger building, but they decided to stay. After all, a 6m-high tsunami would only reach the first floor. Some went down to get their coats - it was cold, there was still snow on the ground. Yuko sent her husband a text message: "Are you safe? I want to go home." The tsunami swept into Onagawa moments later. Footage filmed by a survivor shows how the dark water moved swiftly and relentlessly into town, pushing over everything in its path. Buildings gave way and cars and trucks were picked up like toys, and acted like floating battering rams adding to the wave's destructive power. Within minutes the sea had engulfed areas that were once considered safe. The bank flooded quickly - it took just five minutes for the water to fill half the building. The workers decided to climb up even higher on top of an electrical room standing on the roof of the two-storey building. As they climbed the 3m vertical ladder the strong wind almost blew them off. Many people witnessed their desperate bid to escape to safety. A Facebook post reads: "We get a lump in a throat every time we think about the female bankers who, wearing skirts, had to climb the ladder with unimaginable fear, and male bankers who threw off their coats at the last minute regardless of the cold weather, their fear, despair and regret." The tsunami turned out to be far, far bigger than anyone expected. The town's defences had largely been based on the worst tsunami in living memory - a 6m-high tsunami in Chile in 1960. But this one reached more than three times higher. As a consequence many designated shelters were inundated - even the hospital was flooded, killing four people in the building itself and an estimated 16 in the car park. "Onagawa was one of the areas hardest hit by the tsunami," says Tsutomu Yamanaka, a relief co-ordinator who arrived a week after the disaster for the aid organisation Japan Platform. The coastline of the region is a series of submerged river valleys shaped "like the teeth of a saw", he says, and tsunamis reach great heights as the water funnels into the crevices. A town has little chance in this battle between ocean and mountain. Satellite pictures show how the sea reached in and clawed the town away. More than 5,000 buildings were washed away or damaged beyond repair. "Buildings had been torn from their foundations," says Yanamaka, describing the scene he witnessed when he arrived in Onagawa. "A train had been swept to the hill far from the station." The morning after the tsunami Yasuo Takamatsu made his way to the municipal hospital to find Yuko. He soon had to abandon the car and push a path through the wreckage. He was stunned to find she wasn't there. "There were lots of people taking refuge there, but I was told she'd been taken away by the tsunami," he says. "After that I just couldn't stand up. I'd lost all my strength like it had been washed away." It took Emi Narita's father, Masaaki, longer to find out about his daughter's fate in the chaotic days after the disaster. He himself had only just driven to safety with his mother-in-law, the tsunami "coming over a few cars behind us". For four days he was unable to contact his wife, who was working as a nurse away from home. It was she who told him Emi was missing. "I couldn't believe it. I can't believe it even now," he says. "Until that moment, I had no doubt that she would be safe." Local authorities were overwhelmed by the scale of the disaster, the staff reeling from their own personal losses, on top of massive practical and logistical problems. Almost one in 10 of the town's residents was dead or missing. The majority of survivors were staying in special accommodation for evacuees. They spent their days searching for loved ones, picking through the chaos and walking for miles along the breakwaters on the shoreline. Takamatsu was there too, looking for his wife, Yuko. "I searched everywhere for her, but she was nowhere to be found," he says. The only thing that was eventually recovered was Yuko's mobile phone, found in the parking lot behind the 77 Bank building. At first, Takamatsu thought it wouldn't work because it had been soaked with water, but months later, he took the phone out and tried it. Miraculously, it came to life. Then he saw she'd tried to send another message that never reached him. It said: "The tsunami is disastrous." Of the 13 people on the roof, one, amazingly, survived - he held on to floating debris and was swept out to sea, almost losing consciousness in the icy water before he was rescued by a fishing boat hours later. The bodies of four bank staff were found, but eight are still missing, Emi and Yuko among them. The worker who left the building by car survived. "I couldn't understand why they escaped to the rooftop," says Narita. "There's no more escape there. If they had escaped to the mountain, they could have climbed to a higher place. I thought evacuation to the mountain was a matter of course." The 77 Bank was cleared away along with all the other buildings in the port area, bar one, which was left as a memorial. Although the town began to rebuild, for the bereaved families it was hard to move on. "We are still stuck in 2011," says Narita. Takamatsu is haunted by the message Yuko sent. "I have this feeling that she still wants to come home," he says. "I wish I had gone to pick her up at the bank after the earthquake struck, but I'm still not sure what would have been the right decision. The tsunami warning told us to stay away from the shoreline, and if I'd gone down to pick her up, chances are I would have been taken out by the tsunami as well. "But at the same time, I wish I'd gone and saved her." Two years ago, when he saw divers from the Japanese Coast Guard out searching for the remains of the missing, it gave him an idea: he could do the same, and perhaps bring Yuko home. "So I learned to dive. I felt like I could meet her one day as long as I kept diving," he says. 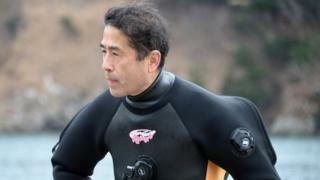 Takamatsu needed to qualify for a diving licence, and he began taking lessons at a diving school. When he talked to Narita about it, and offered to look for Emi too, Narita decided to join him. Learning to dive was a challenge for these men, both in their mid-50s. Takamatsu was terrified by the thought of his oxygen failing, and having to come up for air. "At 5m below, I could swim up without much trouble, but at 20m deep it gets dangerous - thinking about those things always scared me," he says. Narita had other problems. "I didn't get scared, but I couldn't control my body under the sea at all," he says. He found it hard even to regulate his breathing. "I never considered quitting, but I struggled." After months of training, the two men qualified last summer, and have since completed more than 80 dives. The search has given them purpose and lifted their spirits. "I couldn't do anything before I started diving, but after I decided to find my daughter by myself, I could become positive about it - a bit. I get encouraged by searching for her," says Narita. "It was depressing not doing anything," says Takamatsu. "At first I just wanted to find my wife, but now I hope I can find others too." It's hard work. The bay is very deep and most objects are buried under a thick layer of mud, which, when disturbed, also makes it hard to see. They have good days. On one they found a child's calligraphy box with his name on it, and a wedding album. Anything with a name goes back to the owners. Wallets, bank books, and stamps are handed to the police. Photographs can often be restored. An estimated five million tonnes of debris was dragged into the sea by the tsunami. Two-thirds sank just off the coast, covering the sea floor and damaging the marine environment. About a third floated away, in giant patches that could be tracked on satellite images. Boats, buoys, propane tanks and refrigerator doors are still washing up on the shores of North America and Hawaii. But much of the tsunami debris has joined the "plastic smog" that collects in oceanic gyres. Marcus Eriksen, from the 5 Gyres Institute, led an expedition to the debris field in June 2012 - 3,800 km east of Tokyo they spotted buckets, laundry detergent bottles, half a boat, and a still-inflated truck tyre. "One day a shoe drifted by," says Eriksen. "What was eerie was that the laces were still laced at the top - it left us thinking." The bodies of more than 2,000 people, of the 16,000 estimated to have died, have never been recovered. So what about those missing from Onagawa - how far could they have travelled? Not far, says Hiroshi Kitazato from the Japan Agency for Marine-Earth Science and Technology. "I think they sank immediately in the bay. I talked to fishermen in Onagawa town, they said that in the past couple of years they've found no bodies in their fishing nets. This means that in the first two or three years they dredged up dead bodies." Kitazato points out that, coming from a small community, those fishermen would probably have known who they had fished up. "They would have felt very bad," he says. Four years on, this is less likely to happen - organic matter will have mostly "returned to nature", says Kitazato. "Now, we seldom find bodies or their belongings during research activities." Kitazato's work is aimed at helping ecosystems recover, but after the tsunami many people "felt awful about the sea" he says, and part of his remit is to explain to them how the ocean works. His team goes into schools to show its positive side - "how ocean organisms are beautiful and how the oceanic system is useful for human life." Many of Onagawa's citizens moved away to escape their memories of the disaster - and to find work. Takamatsu stayed, and, through diving, has a new-found appreciation of the sea. "I found creatures which I had never seen, beautiful fish such as lumpfish," he says. "You cannot see such worlds usually." Despite the seeming hopelessness of their task, Takamatsu and Narita have no intention of giving up. "I still have a hope we can find something - maybe a human body, regardless of whether it's my daughter's or not," says Narita. His only memento of Emi is a painting he commissioned after her death, which has pride of place in the living room - all of his own photographs were lost, along with the family home. "I want to search for my daughter as long as my body allows me to. If I just give up, there's zero chance. If I keep searching, I might have a chance at least." Takamatsu feels the same way. "I want to continue my search as long as my strength lasts, even though the chances of finding her are slim. I know that she has already passed away, but I don't want her to be left alone under the sea. "Honestly, I still want to find her and bring her home." Yasuo Takamatsu appeared on Outlook on the BBC World Service. Listen again to the interview on iPlayer or get the Outlook podcast.